Despite selling more than 100 million albums and being eligible for entry since 2005, Def Leppard – who won the Fan Ballot with more than half a million votes – never really gave much thought or cared much about the Rock Hall. The UK outfit will be inducted by longtime friend and Queen guitarist Brian May. “Queen is the blueprint for Def Leppard, really,” shared Collen. 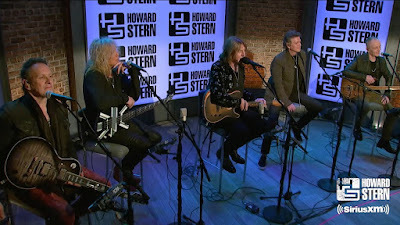 The group shared several stories with Stern during the session, including Elliott’s personal introduction to Bowie by Bono; the singer’s love of Mott The Hoople; sharing the stage with the legends at the 1992 Freddie Mercury Tribute Concert, drummer Rick Allen’s comeback from a 1984 car accident that resulted in the loss of his left arm; and coming of age during the late 1960s/early 1970s when rare media broadcasts of rock music transitioned from black and white to the era of color television.